Site: French Sorrel thrives in moist, well-drained soil in a sunny to partly shaded position. 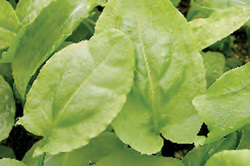 Growing: Keep sorrel quite well-watered. After the first year, when it emerges anew in spring apply a modicum of a balanced organic fertilizer and mulch it with some compost. The desired leaves grow more or less direct from the ground, and on some cultivars can get as much as 18 inches long, though 6 to 12 inches is more usual (and De Belleville leaves are more commonly 3 inches); but there is also a thin flowering stalk that can reach as much as 4 feet in height (though 1½ to 2 feet is more usual). It's best to simply cut off those flower stems as they emerge (unless, as one source remarked, you want to use them later for dried flower arrangements); if you do let seed develop, at least be sure to remove the flower stalks before the seeds can self-sow, lest your sorrel overflow its bed. You should also uproot any excess plants that emerge on runners. Sorrel plants should be divided and replanted every few years; available estimates of "every few" vary from 3 to 5 years. Harvesting: Leaves can be harvested any time after the first couple of months of spring growth, but they tend to be almost tasteless early on, gradually gaining their characteristic and desired acidity and flavor as the season wears on. They freeze well, so, except for occasional fresh use in salads, you might as well make a uniform harvest near the end of summer. Culinary Uses: French Sorrel is an evergreen perennial herb with fleshy green leaves which am mildly sour with a taste of lemon. In cooking, sorrel is generally pureed and can be a perfect base for sauces that accompany poached eggs and fish. This herb is also used in mixed green salads, sandwiches, omelettes, and with soft goat cheeses, veal, pork, and fish. Be careful to cut it only with stainless steel knives and refrain from cooking it in metal pots, because the high acidity of sorrel causes them to discolor.